Want to generate a shorter version of a long URL with minimum fuss? Enter Shorten URL -- the ultimate solution for all your link shortening needs. This Firefox extension supports over 100 shortening services, from the usual suspects like Bit.y, Tr.im, and Is.gd to the more obscure Clop.in and kl.am. Once you've installed the extension, you should add its button to the toolbar which provides quick access to Shorten URL's features. To do this, choose View -> Toolbars -> Customize and drag the Shorten URL button to the main toolbar. To configure the extension's settings, press the button and select the Shorten URL Options item. 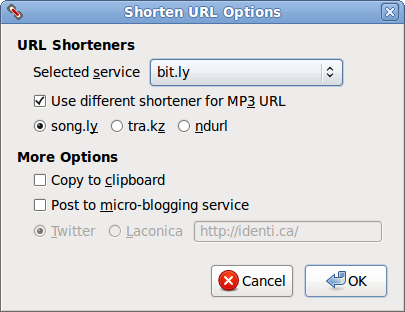 In the opened dialog window, you can specify the default link shortening service, pick a different service for music files, and set the extension to copy the shortened URL to the Clipboard. Besides shortening URLs, the extension can also automatically post the shortened links to the Twitter or Identi.ca micro-blogging services. To enable this feature, tick the Post to micro-blogging service check box and select the desired service. To shorten the current URL in the Location toolbar, click on the Shorten URL button. This replaces the URL with its shortened version. Shortening a link in the current page is equally easy: right-click on the link and choose the Shorten This Link URL command.